I’m not usually a sporting game fan but this game is topical due to The Rugby Word Cup finishing, only days ago. This game is like ‘Paper Toss’ and just as addictive but it’s free!. 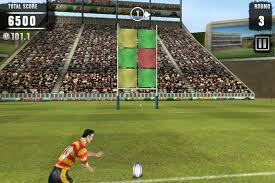 You are a rugby player with the posts in sight, you swipe the screen up and with a slight gradient to determine the direction, the speed at which you swipe determines the power of the ball. It starts off quite easy but looks to get harder as you earn more points. The points you earn can buy kit (not as important, just accessories) and other stadiums (international and club) with each of these has another game mode attached. First you start off with ‘beat The Clock’ where you have to get as many penalties as you can in 60 seconds. Once you have bought the ‘club stadium’ you get the ‘Hit The Target’ game mode which sort of explains its self. Once you have bought the ‘international stadium’ you get the ‘Break The Wall’ game mode, where there is a ‘wall’ in the posts and you repeatedly hit it to break it, again obvious. This game is great for a quick gaming fix, but I worry it might not do for a longer time but that’s, a matter of opinion.